WAFFLES: Christmas decorating is the BEST! Check out all the new toys, Boss! There are lots of sparkly stringy things. They even light up! WAFFLES: Lots of red balls. WAFFLES: And look! Glogirly even hung some up for me to whap. Don't you just love getting ready for Christmas, Boss? KATIE: Not when it involves wearing this ridiculous collar. 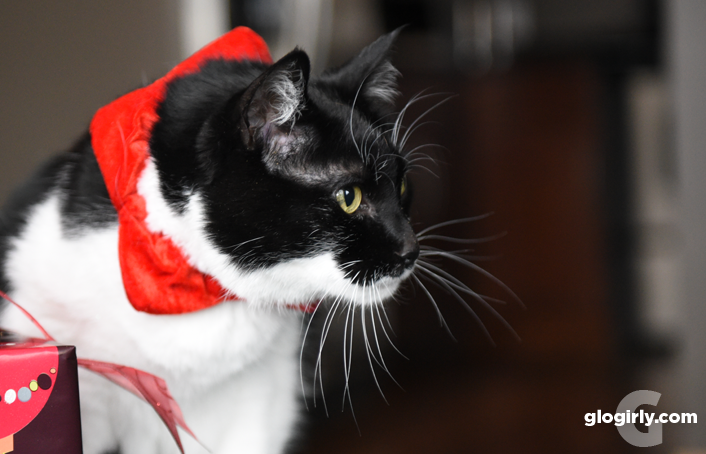 WAFFLES: If you don't like your collar, I'll borrow you my Santa suit, Boss. KATIE: Yeah, that's not going to happen. 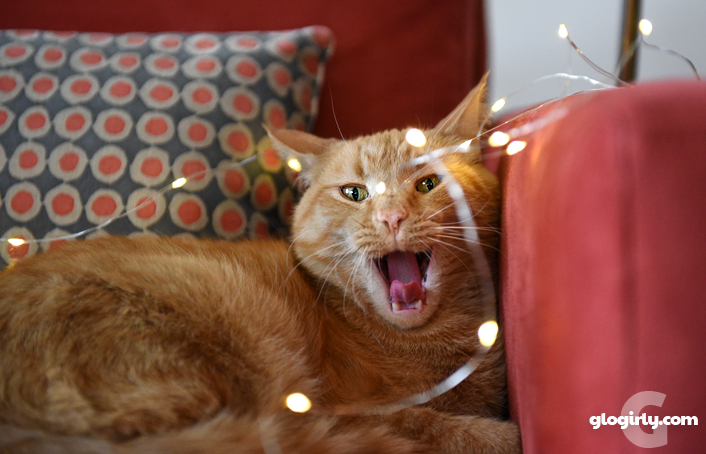 Get Out the Twinkle Lights! Thanksgiving is so last week. And you know what that means! Glogirly is busy getting the twinkle lights untangled, unpacking the Christmas balls, and making sure Waffles still fits in his Santa coat. His coat is a favorite around here. It's styled like a harness, which Waffles has always seemed to be very comfortable in. And though he can wear a harness for a few hours with no problem, we still only slip him into his Santa coat for the occasional photo op. Last week Glogirly decorated our real Christmas tree, which she planted outside last year. It's a beautiful Colorado White Fir and shaped just like a Christmas tree. She put both traditional colored bulbs on it and small white twinkle lights so it really sparkles. We'll try to get a picture of it! We still have a few of our 2019 Desk Calendars! If you'd like to order one, just click one of the PayPal buttons below. 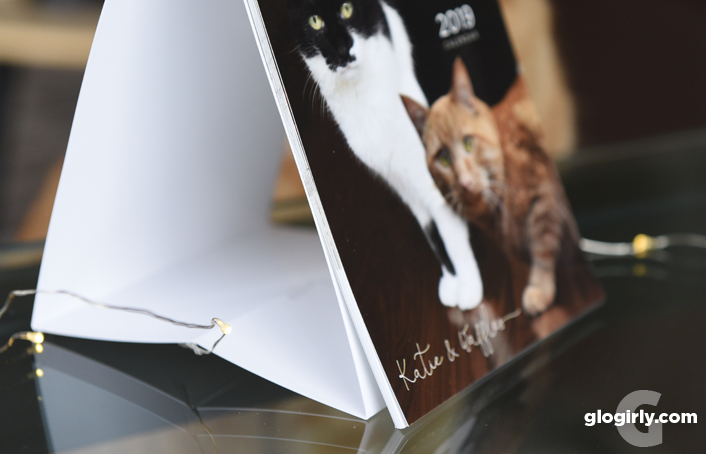 It's a pop-up desk calendar, 5" wide by 7" high, featuring 14 of our best photos printed on high-quality, heavyweight paper stock. Just unfold it to stand, then flip over each month as the weeks and days fly by. You're guaranteed a giggle and a smile every month. If you'd like to have one of your own or give one as a gift, purchase them directly from us (below) and we'll ship them to you directly from Colorado. The calendars sell for $14 each. We're also offering two for $24. Shipping within the US is just $5 for either 1 or 2 calendars. Shipping is also available to Canada and worldwide. See costs below. Ordering is safe and secure through PayPal. If you have any questions, please send us an email at glogirl@visi.com. A portion of each calendar sale will be donated to a local cat-only rescue organization. Angels With Paws Cat Rescue and Adoption Center in Lakewood, Colorado is a small but powerful rescue organization that works hard to make a difference for cats and the people who love them. 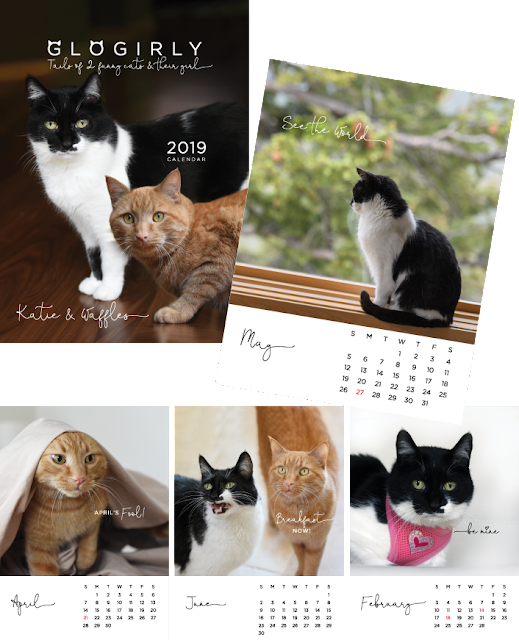 And to make the proceeds from our calendar go even farther, we'll be forwarding them to Angels With Paws on Colorado Gives Day, Tuesday, December 4. It's AWP's most important fund drive of the year. Waffles is so ready to help decorate! A Colorado Christmas sounds SO awesome! We aren't doing anything for the holidays this year... but my human has resolved that next year is going to be a GREAT Christmas season! we love that you planted last year's Christmas tree - our grandpa used to do that when mom was a kid (now they have a fake tree in the house). 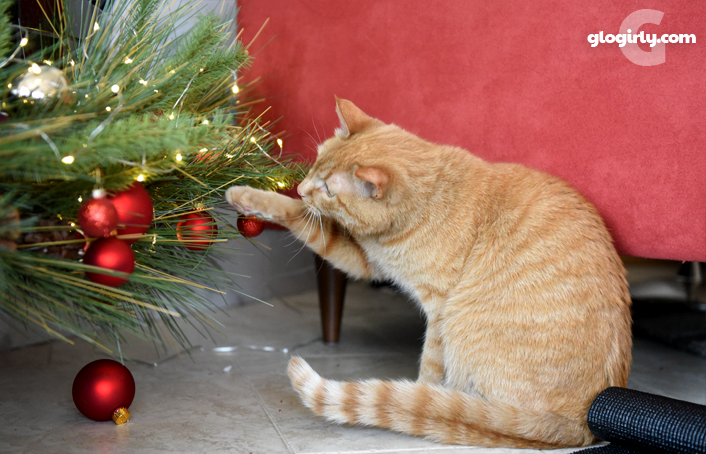 Can't wait to see a photo of your outdoor tree! 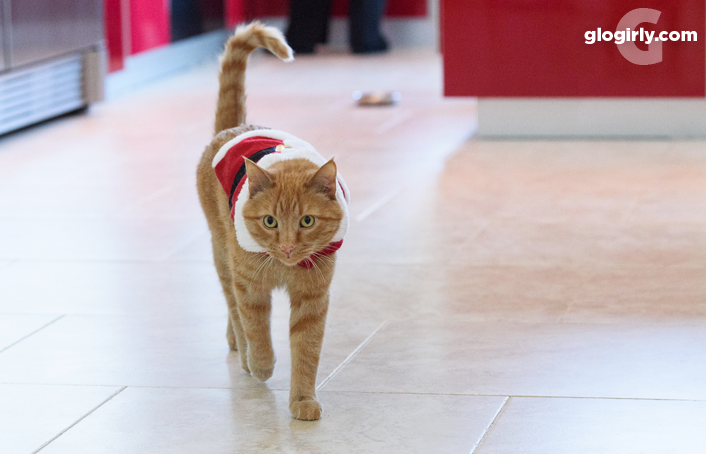 Waffles always looks so stylish in his coat! You look good in the Santa suit, Waffles. Whapping ornaments is what Christmas is all about! Don't chew on the wires of the lights. They look adorable. Got my Christmas tree up and just a few decorations. You both look so darling and festive! Can't wait to see the outside tree.